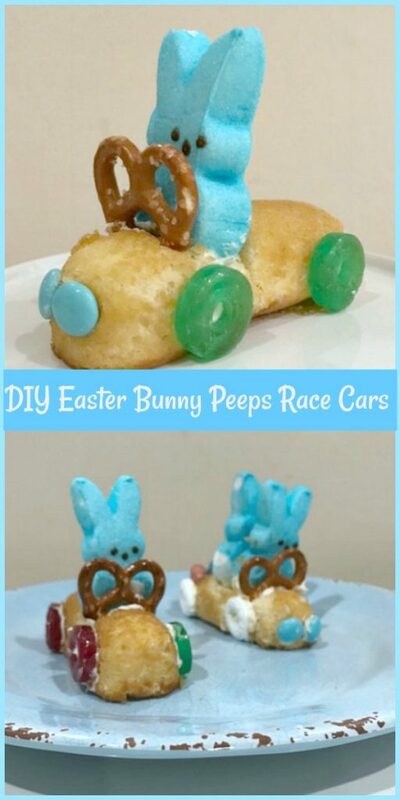 DIY Easter Bunny Peeps Race Cars – Here’s a fun food craft for spring and Easter. The kids will love it and so will anyone who gets to eat one of these. Have fun and enjoy! I found this food craft project years ago when my daughter Tori was a little girl. 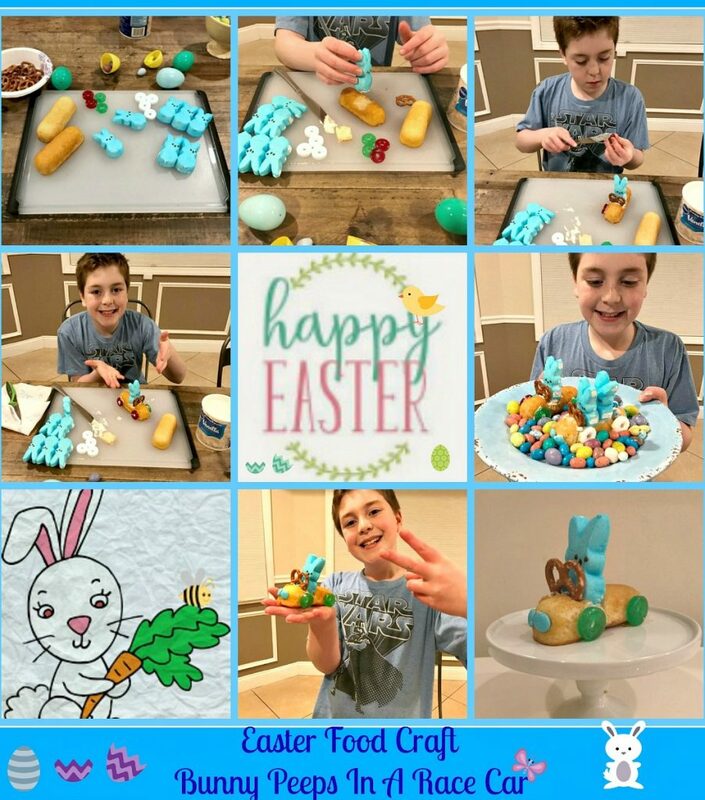 We had so much fun making this edible craft project that it’s now a tradition I kept up with my son Josh. We make a bunch and give them out to his friends. They work great as place settings. It’s a fun, cute idea. Just wrap each one in clear plastic wrap with a ribbon and place the name on them. Everyone gets to leave with this yummy homemade treat that your kids made. Let the kids use their imagination. Add sprinkles, marshmallows, you name it. They don’t have to be perfect looking. Everyone will know they were made out of love. Have fun with the kids and make a few yourself. Happy Easter! 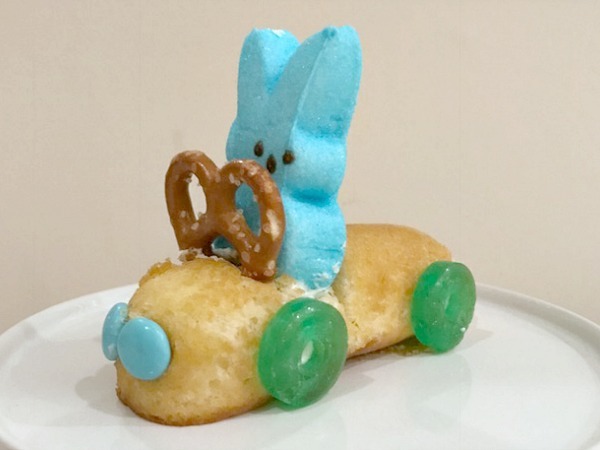 .Put a small amount of frosting on the bottom of the Bunny Peep. Place in cutout and gently press down. Not too hard. Then take a pretzel and put a small amount of frosting on the bottom as well. Place in front of the Peep. Gently press that too. Let set up for about 5 minutes. While that’s setting up. Unwrap the Lifesavers. Put a little bit of frosting on the side with the writing. Now, gently place where the wheels would go. Press lightly again. 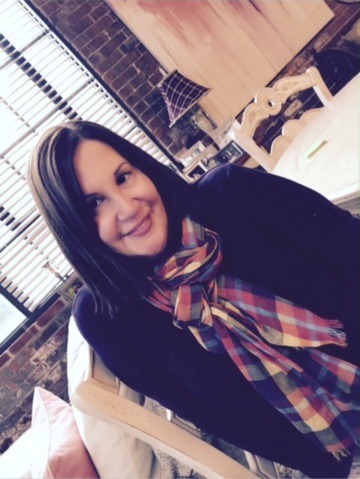 (As seen in the photos.) Do the same with the M&M candies for the front lights and the mini color eggs or jellybeans for the taillights. Add just a little bit of frosting since they’re so little. Look how cute they turned out! Have fun making these and enjoy the yumminess! 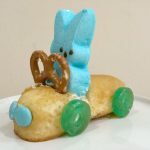 2..Put a small amount of frosting on the bottom of the Bunny Peep. 3.Place in cutout and gently press down. Not too hard. Then take a pretzel and put a small amount of frosting on the bottom as well. Place in front of the Peep. Gently press that too. Let set up for about 5 minutes. 4.While that’s setting up. Unwrap the Lifesavers. Put a little bit of frosting on the side with the writing. Now, gently place where the wheels would go. Press lightly again. (As seen in the photos.) Do the same with the M&M candies for the front lights and the mini color eggs or jellybeans for the taillights. Add just a little bit of frosting since they’re so little. Look how cute they turned out! Enjoy! !